Before embarking at an adventure to create a new coin, please read our recommendations. Get acquainted with coins that already exist! It‘s not enough to know everything about Monero and bigger coins and that you think that you know everything. Meet the „small“ coins, especially those who no longer exist. Learn about their mistakes! 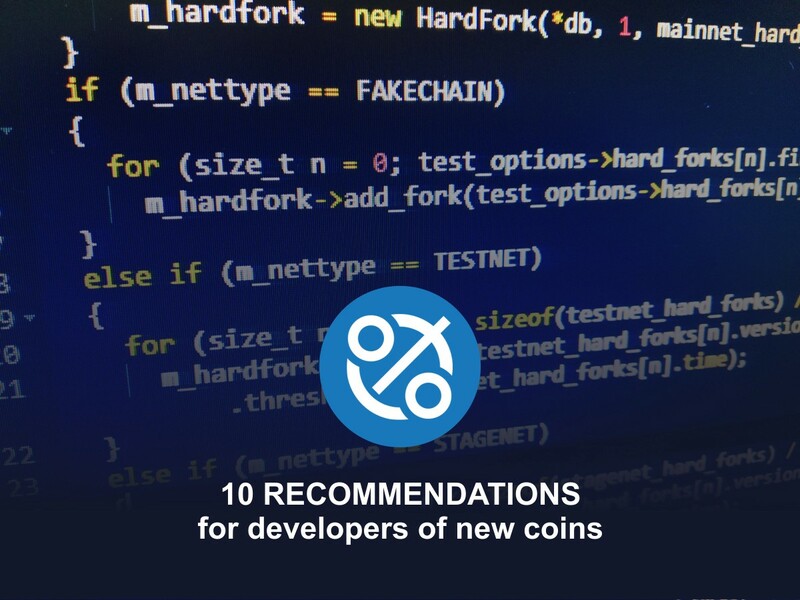 We base these recommendations basically on the experiences of such coins. Do not make a „coin without a story“, a coint that doesn‘t bring anything new. It‘s not enough just to make a copy of an existing coin, change it‘s name, logo and ticker and expect that it will become planetary popular. It will not! Think, think, think. Explain the idea in detail. Ideas like „coin for buying something“ or „coin for paying something“ or „coin to exchange something into something“ or „the only coin that serves for that and that“ no longer pass! If your idea is reflected in a single sentence on a website or Bitcointalk … there is nothing of it. Make a case study, PROVE that your idea is applicable in practice. Write a Whitepaper, but not by making a cover page and writing a coin specification on the other page, and on the other 30 pages „owerwrite“ the Cryptonote whitepaper. Believe, serious miners and investors READ whitepaper. Do not go on your own in this adventure in any case. In short — You will not succeed. You must to have more people in the team that will deal with different things. You need to provide at least two or three developers who can work together. Perhaps you are a great, mega, giga, top developer, but — you will not succeed by yourself. The reason — the development of a coin si not your main job (you are already doing something for living), and first problem with the coin (and there will be many challenges) you will not have time for solving it. You will lose the trust of the community. VERY important segment. Find an experienced marketers who will promote the idea of the coin, even before the genesis block. Don‘t be sressful, be honest in your intentions and do not exaggerate. Don‘t spam chats and forums without idea. That time has passed. Find the professionals. It will pay off. Serously deal with the name of the coin, let it be brief and if it‘s possible it should contain one word. Do not have to change your or sign after a while, because some company in the world has a registered name or sign similar to yours (this has already happened). Design a SIMPLE sign of coin. Make it a „flat“ design that will be recognizable at first glance. Create an unique and professional website that inspires visitors. as well as other promo materials. Coordinate informations on a website with posts on other places (eg. Bitcointalk). It is INDISPENSABLE that on the website is writen that, for example, coin uses Cryptonigh Trtl algo, and on some forum is information that it uses Cryptonight Lite. Do not indulge in this adventure before you provide at least 2–3 active and stable mining pools (official mining pool is required). Find friends who will support mining. When we say „support“ we mean that at least 20–30 of them should direct their RIG‘s on mining your coin. And this is not for one of two days, but for 2–3 months! If you can‘t provide it — do not make a coin. If your friends do not believe in your idea (coin) — how do you think that other people will believe you? You MUST build a presence in Discord, Reddit, Twitter and Telegram from the beginning. And there you also need your people who will be active and to know how to answer question. If you do not have these channels of communication — you will not succeed! No way. That time has passed. People no longer trust to anyone because they are deceived by dozens of times. Do not rush. The big mistake of new coins is the effort, from the very beginning, to appear on „any — give what you give“ exchange. It‘s better not to waste time, focus on development and promotion, and exchanges will come alone. Build a community because a number of interested in your coin is important for exchanges. If your coin mine 500 miners, do not worry about exchange. Early appearance on some exchange dos not mean anything! Happiness is always important and unpredictable, but we believe that at least at the most of the above recommendations you increases chances that it happens. These recommendations are derived from the subjective observations and experiences we have gained from cryptunit.com. Cryptunit is widely known in the Cryptonote community, as a great place where all cryptonote miners will find out about the new coins. Cryptunit.com is widely known in the Cryptonote community, as a great place where all cryptonote miners will find out about the new coins.